Indulge your inner chef with this user-friendly adjustable slicer from France. It duplicates knife skills that professional chefs take years to master, producing consistent results. V-shaped microserrated blade cuts vegetables and fruits with perfect precision. Supersharp cutlery grade stainless-steel blade. Slices from paper-thin to 3/16″ thick. 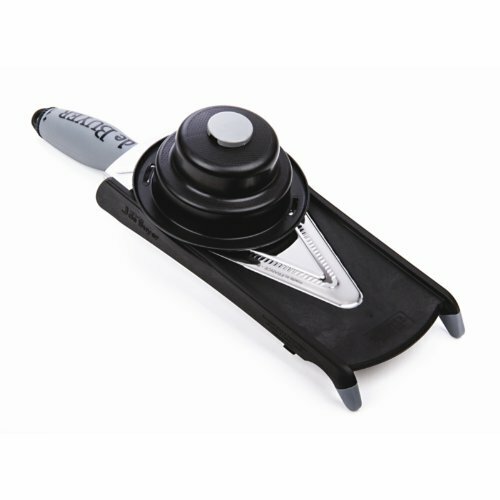 In-handle thumb wheel adjusts slicing thickness. Equally efficient with firm produce and soft foods like cooked beets, ripe tomatoes and pears. Ergonomically designed pusher protects hands. Pusher clips beneath tool for space-saving storage.